This piece was originally written for the Baker Street Babes and can be found on their website here. 130 years ago today, Beeton’s Christmas Annual took a chance on a story by new author, a doctor in his twenties who happened to be named Arthur Conan Doyle. A Study in Scarlet is a peculiar tale by modern standards, with its separated sections and unfortunate depictions of Mormonism. Even at the time, it didn’t create much of a splash at initial publication. But there’s something about it. There’s something about the youngest, sharpest incarnations of two people meeting for the first time. It’s impossible now to read the story without knowing the context of what is to come, but I believe that if you could, it would still have the power to whet your appetite and make you crave more of the interactions between Holmes and Watson, as the doctor takes you on the roller coaster journey of trying to understand his new flatmate. It was easier to know it than to explain why I know it. There’s also something about the detection, the “attainable superpower,” as Benedict Cumberbatch once described it. Holmes is always ahead, but he’s not superhuman. This youngest, sharpest Holmes does what all of us do, but he does it better and more, and he makes us realize, or at least imagine, what it would be like to understand the world around us to a far fuller extent. There is a mystery about this which stimulates the imagination; where there is no imagination, there is no horror. A Study in Scarlet is filled with the sense of adventure and razor-edge plotting that would come to characterize Doyle’s short stories. His ability to craft suspense, while perhaps not yet at its height, is certainly evident in the story’s most thrilling moments. Another Holmesian through-line is the question of vigilante versus traditional justice, the question of whether horrendous acts can be justified. The very young Doyle crafted an engaging mystery; but, characteristically, he couldn’t resist including the kind of moral dilemma that would pepper the pages of many of his greatest stories. There is nothing new under the sun. It has all been done before. Except it hadn’t been done before. Though few realized it at the time, when A Study in Scarlet burst onto the scene, it ushered in an era in which the world would be captivated by a detective who could be moody and kind, genius and ignorant, contemplative and frenetic. The Era of Holmes and Watson, when two men with disparate habits and personalities would forge one of the most engaging partnerships in literary history, came with more of a whimper than a bang. I think that’s part of what makes today wonderful. I wish I could travel in time to tell Doyle that his manuscript isn’t going to linger in oblivion. Jokes related to his feelings about Holmes aside, I wish I could show him that the era he created would never end. Instead, I want to tell him, it will endure through changing tastes and mores, somehow remaining relevant and poignant no matter how much time elapses. Happy 130 years to a story that started as nothing–and changed the world. Mystery Queen (Queen of Mystery) is 2017’s newest contribution to the ongoing Sherlock Holmes zeitgeist. Produced by South Korea’s Public Broadcasting network (KBS, aired on KBS2), it’s far from being a rehash of familiar territory. Instead, it breaks new ground with a smile, a wink, and a refreshingly self-deprecating tone. The opening episode wastes no time whatsoever in introducing the key players, beginning with an impressive action piece in which we see both the street smarts and physical prowess of our Watson (Wan-seung), played with rough charm by veteran star Kwon Sang-woo. Any fight that includes our hero breaking a clay flowerpot into a perp’s face is one I can get behind, and I particularly like the visceral quality of the action throughout the episode. This no pretty, choreographed martial arts-style combat. It’s about fists and survival. Our third major player also comes into the picture during our convenience store case, the Inspector Lestrade character (Chief Hong), played by Lee Won-keun. The youngest Lestrade adaptation I’ve seen on screen to date, Chief Hong has an endearing younger-brother relationship with Seol-ok, whom he calls Seonsaengnim (a Korean title used for a respected mentor) . We are quickly shown that he’s risen to being precinct chief at an unusually young age, mostly because she’s been helping him solve difficult and perplexing cases for quite a while. Hong is no idiot, but he lacks Seol-ok’s speed of thought and ability to connect unusual clues. In this iteration, however, he’s humble enough to willingly look to the person who has the skills he lacks. The episode’s central mystery, one with higher stakes that potentially sets up a series arc, is presented in a visually-engaging way by showing various characters’ different mental constructs of how the crime was committed. As clues are added and theories are refined, we see the changes reflected in these psychological reconstructions. Overused, this could be annoying, but in this episode, it’s relied upon sparingly and simply serves as a way to show rather than just telling, and it’s a welcome technique. Mystery Queen is not a strictly procedural mystery show. The above is simply the setup, and as the story is fleshed out, it’s clear that we’ll be delving into the mysteries of our characters’ lives as much as the crimes they solve. Seol-ok is the wife of an absent prosecutor and daughter-in-law to his domineering, social-climbing mother. For years, she’s harbored a dream to become a police detective (and has the skills to pass the test) but has deferred her dream to further her husband’s career. Our closest equivalent to Mrs. Hudson is Seol-ok’s best friend, divorced chef Kyung-mi. Some of the episode’s strongest moments are between the two women, who have painfully honest conversations about love, marriage, and divorce. Their friendship, and the struggles they share, takes a charming series and provides it with emotional weight. I’ve covered quite a bit of ground, but I’d be remiss in not mentioning that the series contains a hefty dose of comedy. It’s not a constant slapstick-fest, and it has plenty of dramatic moments, but the overall tone is light. I find that particularly refreshing after the slew of extremely serious and self-important Holmes adaptations that have come out in recent years. I love larger-than-life, superhero Holmes. I also love a Holmes who’s just trying her level best to keep her nosy relatives from finding out that she’s a super sleuth on the side. An added dollop of elderly ladies who lunch and do their own version of detective work is particularly hilarious. Culturally speaking, Mystery Queen contains enough recognizable nods to Doyle’s Holmes that even viewers who are not aficionados of KDrama should be able to enjoy it and make it through some unfamiliar cultural territory. Thus far, the most jarring aspect for viewers from more individualistically-inclined cultures, I think, will be Seol-ok’s home situation. Simply, going into it with the understanding that in-laws are treated like immediate family and that social structure dictates a high level of respect for and obedience to family and societal elders would be helpful. I’m pleasantly surprised by Mystery Queen. It’s funny, it’s quirky, it’s intelligent, and it re-adapts characters I know and love in familiar but fresh ways. Even more than that, as a feminist, I’m delighted to finally find a series that introduces a female Holmes with a realistic life. She’s brilliant, and she’s odd. As many brilliant and unusual women have found, society doesn’t usually reward those who choose to walk a different path. It would have been easy to give Seol-ok an easier life, to make her single, fabulously wealthy, and able to do whatever she wants. Instead, the writers of Mystery Queen have given us a far more complex gift, a woman with the mind of Sherlock Holmes and a life that looks a whole lot like that of many women around the world. Seol-ok is no superhero. She’s a real-life woman trying to juggle her talents and society’s expectations, and sometimes that’s even better. 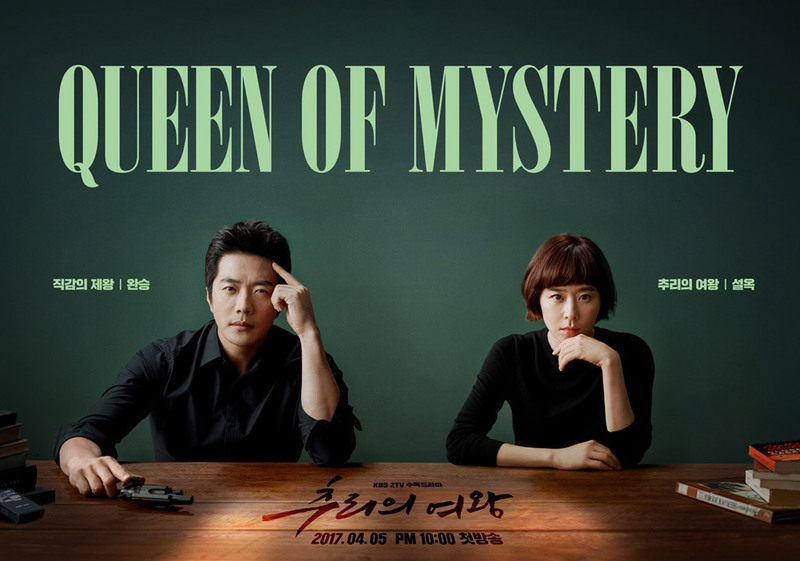 Mystery Queen (Queen of Mystery) airs on KBS2 on Wednesday and Thursday nights at 10:00p.m. and will run for 16 episodes (barring an extension, which would be announced later). It can be viewed with English subtitles at Viki and Dramafever. I’ll admit it: This book had me at the revelation that the high school-aged narrator’s locker was 221A, meaning, of course, that the new girl, Sherlock Holmes, would soon take possession of locker 221B. Garrison isn’t the first author to craft feminine versions of Holmes and Watson or to write about Holmes’s younger years, but The Twisted Blackmailer is one of the best-written books I’ve encountered in the genre. As you might have tracked from the comment about lockers, the book also takes place in the modern world. Since the advent of modernized Holmes on TV, this isn’t a particularly difficult concept to take on board, particularly since Garrison’s characterizations are spot on. Canon aficionados might have guessed from the title that the story riffs off Doyle’s Milverton case. This book takes its own twists and turns and is inspired by the original rather than being imprisoned by it. Particularly enjoyable is Watson’s sardonic practicality and literal narrative style that sometimes seems to reveal more than the narrator intends. That’s a difficult thing to achieve, but Garrison manages it seamlessly. If you decide to give this book a try, don’t be afraid that you’ll miss the Sherlock Holmes we know and love. Our favorite detective may be a girl in the modern world, but the essential Sherlock Holmes is lovingly present on each page – maddening, endearing, hilarious, and brilliant. If you’ve ever wondered what it would be like to go to high school with Sherlock Holmes, this is certainly the book for you. If you’re leery of non-traditional approaches, don’t be put off. 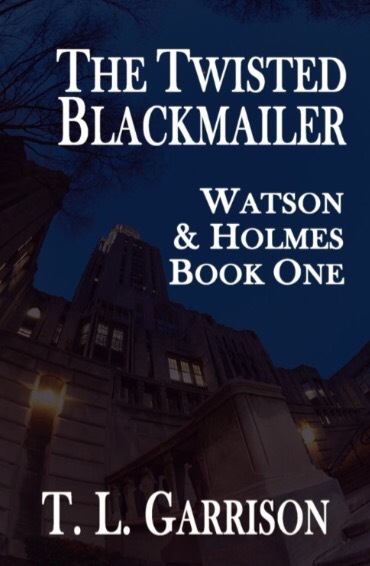 The Twisted Blackmailer is a beautifully-written book that tells an engaging mystery story involving a Holmes and Watson who are as irresistible a duo as ever, while teasing upcoming mysteries for future stories to solve. Hard to put down, and I’m looking forward to the next one. The above-reviewed work was provided for consideration by the publisher. All opinions expressed are the reviewer’s own. For several years now, I’ve been writing regularly about Sherlock Holmes, more than I’ve ever written about anyone else. That means that he (and Irene Adler, the co-protagonist of my novels) lives in my brain in a way that few characters, if any, ever have. I’m currently in the editing process of my fourth Sherlockian mystery novel, but what many people don’t know is that I wrote the first draft of it while I was undergoing chemotherapy for colon cancer. For a while each day, I escaped the pain, fatigue, and depression the drugs caused by jumping into Holmes’s world and walking with him. He was my companion in the cancer center and a friend who helped me through some very dark days. Fiction matters, and stories are important, not just the heavy, sad ones. Being able to escape to a mental world populated by Adler and Holmes made one of the most difficult times in my life less bleak. I have a special place in my heart for all of the stories and characters I encountered and enjoyed during my cancer treatments, but Sherlock and Irene dwarf the rest of them because I didn’t just read about them, I also wrote. I forced myself to enter their world by creating, and in so doing, I found a deeper purpose and a satisfying temporary respite from my daily struggles. I know that nothing I write will ever be perfect. That is the curse and blessing of the author, because it means flawlessness is unattainable, but that, at the same time, improvement is always possible. Still, though I know I can’t reach perfection, I write–because I know how it feels when a story becomes more than just fiction and a character becomes a friend. The chance to offer that to someone else who might need a new world to escape into and an imaginary friend today? That’s a priceless gift.